Benefit shooting event with ALL proceeds going to H-3, an organization that provides service dogs, at NO COST, to Combat Vets in need. Please visit www.H-three.org to learn more about them. The event will take place at 37PSR- a Veteran owned shooting and training facility in Bunnlevel, NC., just a few miles from Ft. Bragg. Please visit www.37psr.com for more info on the range. The shooting match has been designed and will be managed by ZSA, Zombie Shooters Association, a Veteran owned shooting sport. Please visit www.zombieshootersassociation.com for more info on the sport. All weapons for the event are being provided by ZSA and 37PSR for the competitors to use. All ammo for the event is being graciously provided by Defender Ammunition Company, a Veteran owned company (anyone starting to notice a trend here?). The main shooting event will consist of 5 unique stages of fire, where each 4 man FIRE TEAM will shoot a wide variety of weapons to handle the "Zombie threat". The time it takes for the FIRE TEAM to shoot the stage, plus any added penalty time, will be the TEAM's score, times from all 5 stages will be combined, and the FIRE TEAM with the lowest total time will be the winner. Failing to "kill" a Zombie is a 5 second penalty, 10 seconds for failing to eliminate an Infected target and 10 second penalty for each hit on a non Zombie uninfected target. Sounds complicated but it's not, very simple, SHOOT FAST AND DON'T MISS!!! If you have read this far, thank you, and you would like to compete or help out, there are numerous ways to do so. 1st- BE A SHOOTER!! This is the most fun way to help out. As this is a benefit event, we are asking each shooter to pledge or be sponsored for $250, or $1,000 for a 4 man FIRE TEAM. 2nd- Become a corporate/business/personal donor. 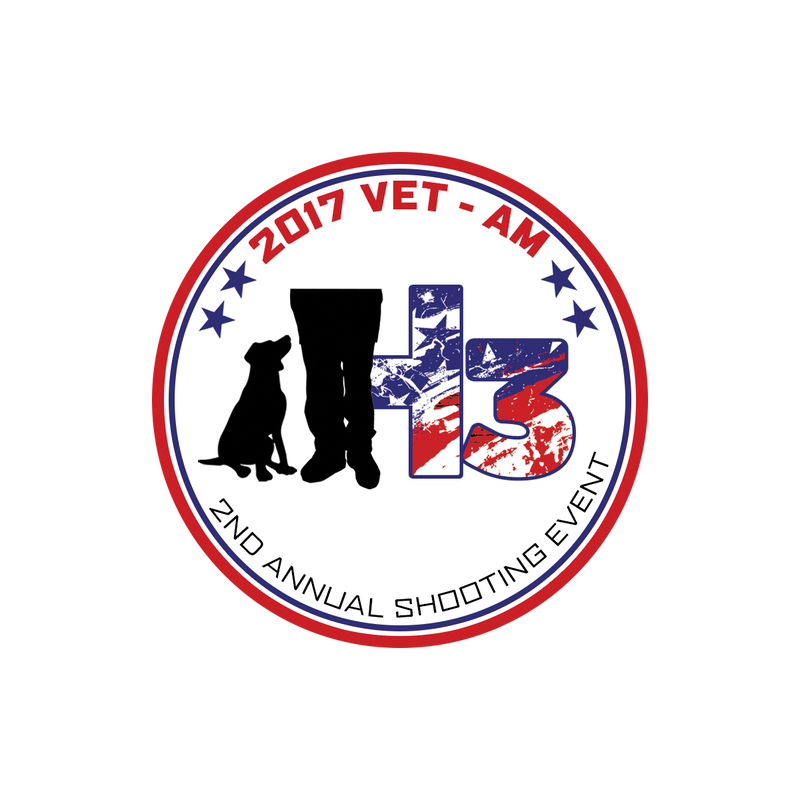 We will accept cash donations (donations are tax deductable, as H-3 is an IRS recognized non profit) to be put towards sponsoring a shooter. 3rd- Donate merchandise or gift cards from your business, or anything that has value that we can offer as prizes to the shooters or auction off during the event for additional revenue for H-3. 4th- Just show up and show your support for our Veterans. We will be needing help for some admin duties, Range Officers, score keepers, magazine loaders, target pasters, water boys, whatever. If you can't help financially, please come and support in any way you can, this is a TEAM EFFORT, just like the Military, it takes a huge TEAM of, Marines, Soldiers, Sailors, Air Men and Coasties to get the Mission done, our MISSION,,, raise as much $$ as we can to provide as many service dogs as possible to our Vets in need. Please understand, every penny we raise will go straight to H-3 to cover the cost of providing the dogs to the Vets, no admin salaries, no admin costs, no advertising expenses, no BS. If you have an organization, shooting club, range facility, motorcycle club, business, anything that has a group of like minded Americans that want to help, PLEASE contact us, as we would be happy to set up a shooting match for you to raise $$ to sponsor your own FIRE TEAM, prior to Veteran's day. There will be a face book page set up that will have up to the minute info for you to see and share. We will be listing all our sponsors and contributing businesses as they come on board.